At the beginning of the year, in a column on my ‘most anticipated books of 2014’, I wrote: ‘In recent years, Wayne Macauley has well and truly arrived as one of our most exciting prose practitioners. No word on the content of his forthcoming novel, but I don’t think we care – we’re reading it!’ Well, I can now confirm that this readerly compulsion is repaid generously. 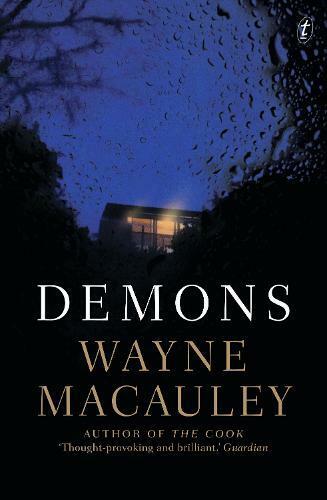 In Demons, Macauley is at his caustic best: here, ‘the greatest country on earth’ may just have found its wickedest chronicler. In the depths of winter, a group of friends gather in a holiday house on the Great Ocean Road: think an open fire, food and wine, and old-fashioned yarn-telling (for good measure, phones are banned). In an increasingly charged atmosphere – a storm rages; the roof is leaking; and a teenager, in despair at the adult world around her, barricades herself in her room – the stories the friends tell begin to hit uncomfortably close to home. But there’s always wine! Copious glasses of Heathcote Shiraz are poured, and, of course, a Clare Valley on rotation. But what if all this indulgence is just a favourite tool of these friends, and contemporary society at large, to self-delude? As it turns out, their seemingly innocent ‘exemplary stories’ betoken an emptiness at the heart of our culture that no amount of ‘lifestyle’ can redeem. How we should live, and to live in truth, is Macauley’s grand theme – one which art, like this novel, is uniquely positioned to address. Macauley is as angry a social observer as fellow Melbournian Christos Tsiolkas, but his work is spiked with a now trademark sardonic bent – he mounts here an at once hilarious and biting critique of our rampant ‘culture of narcissism’. At the same time he proffers a passionate case for the power and value of art in our hopelessly superficial, morally vacuous 24/7 world. Even though the landscape of late modernity is a barren terroir indeed, Macauley would seem to say, the harvest is still what we make of it.